Since most visitors to this site (real visitors, not my mom and various other friends) seem to end up on Velo Tales after having searched for some info on TransBaviaans. 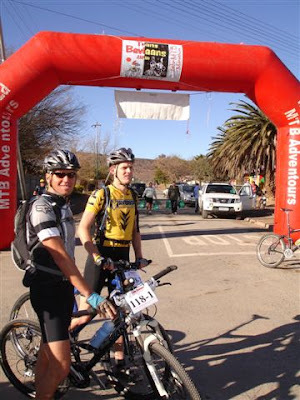 With my fifth Baviaans coming up this year, I thought I would put up some handy tips and hints. plastic bags for shoes if it rains. The guy who wrote this was quite worried about getting cold - half of that stuff is overkill, but rather have too much warm stuff, than too little. 4. Energy drinks and bars - get not only sweet ones, but also muesli type - one may get sick of sweet stuff, so consider potatoes, sandwiches,coffee and rusks, fruit. No wonder it takes the back markers so long - they are virtually shipping an entire bike shop through the Baviaans bit by bit. Remember, it is a team event - each person doesn't have to carry their own spares. 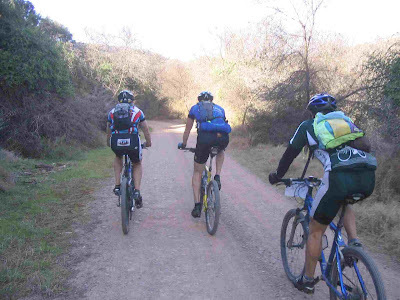 Nice to have - the scenery is quite spectacular, and now that the backup vehicles don't go through the Baviaans anymore, proof that you rode it is harder to get. Some people do sleep along the way, or you can sleep at the finish. Obviously, this goes in the backup vehicle, and not in the CamelBak. Although with the vehicles no longer going through the Baviaans Kloof, any vehicle will do. DO NOT TAKE A VENTER TRAILER THROUGH THE BAVIAANS KLOOF. Been there, done that, destroyed a trailer. And it wasn't even ours! 14. A light that works off either gas or car battery. 15. Wood,grid and meat,bread/rolls - you could do with it after eating energy bars all day ! Very sound advice - why isn't this #1? So, it looks like we might be in for a wet one this year. On final thing - lights. Get the best light you can afford. But don't be silly. It is a team event, mostly on big wide roads, so the combined light of the team is usually more than enough. I rode two TransBaviaans rides with a head mounted Cateye halogen light that took 5 C batteries in a holder in my CamelBak. It wasn't great, but it did the job. It didn't cost me an arm and a leg either. I spent a small fortune and got myself an Exposure Enduro from USE in 2006. I haven't looked back. It makes such a difference. The better the light, the faster you go. The race is very weather dependent. The best ride we have had was 12 hours, and the worst was 18 hours. Oh yes - one last thing. Make sure you read the map. Otherwise you WILL get lost. You only have to make 5 turns throughout the whole race. Just make sure you make them at the right places. You have been warned.